While the concept of alternative or a supplementary currency is generally not new, the concept of an open-source currency without a central distribution agency or control . In contrast to regular monetary systems with state-regulated legal tender, with crypto currencies payments can be made directly between parties without involving a financial service provider. This might improve speed, cost, and convenience and, thereby, economic benefit; so there is disruptive potential . Altogether, some 1000 crypto currencies are known , but the most widespread and important one is Bitcoin , with a market capitalization of about 40% of all cryptocurrencies. Bitcoin was created in 2008  and currently has two roles: as a currency in the goods and service market, and as an asset in the financial market [5,6]. Bitcoin has a high risk premium as an asset, which reflects the uncertainty of its value [6,7], and evidence shows that the value of Bitcoin is primarily forced by speculative investors who want to gain experience in new markets  and exploit the high returns possible because of high volatility . Bitcoin is not used much as an alternative currency or medium of exchange, however, and it is much less mature [5,6]. Bitcoin (and “cryptocurrencies” in general) is neither a commodity currency nor a fiat currency , but rather a hybrid. Its value cannot be regulated by authorities, and is not explicitly tied to economy . Features of Bitcoin are thus new for a currency. This raises the question whether Bitcoin has features that impede its use as a currency. There are only few economic analyses of Bitcoin as a currency [9,10], but Baur  suggest that high volatility might be a reason for using Bitcoin as an investment rather than currency. The high volatility of Bitcoin stems from the fact that changes in demand must be absorbed by price adjustment . Of course, volatility is not the only criterion to affect the role of a currency . There are others, such as the lack of functional transparency of a cryptocurrency, unclear legal status and the absence of guarantees that exchange activities will be continued and not stopped abruptly . Volatility is an important criterion of a currency, though . Holders of a currency will tend to sell it in response to high volatility [14,15] and as  showed for three African countries, high currency volatility impedes exports. Thus high volatility may prevent use of Bitcoin as a currency [10,16]. There are numerous comparisons of the volatility of Bitcoin against many widely-used currencies, like USD or EUR [8,16]. Bitcoin volatility tends to decrease with trading volume, and consequently, volatilities of emerging market currencies might be more comparable to Bitcoin volatility. What is missing so far, though, is a comparison of Bitcoin volatility with the currencies of least developed countries. Such a comparison is sensible because if the results show that Bitcoin volatility is less than the volatilities of the currencies of these countries, then the assessment of Bitcoin as a currency for these markets (or for specific needs) might have to be discussed anew. The research gap this paper thus attempts to address is the unknown difference between Bitcoin volatility and the volatilities of currencies of least developed countries. Moreover, as volatility correlates negatively with trading volume , Bitcoin volatility might decrease and approximate the volatilities of currencies of selected least developed countries, i.e. another research gap to be addressed is whether, with respect to volatility, Bitcoin is closer to least developed countries than to other cryptocurrencies. Therefore, volatilities of other important cryptocurrencies will be compared too. The results might have important practical implications. Bearing in mind that volatility is only one criterion, if Bitcoin volatility is considerably lower, it might be interesting as a (possibly complementary) currency for these countries. A cryptocurrency is an exchange system allowing for secure transactions between partners in a decentralised peer-to-peer-network, based on encryption. Creation of additional units of the currency is strictly regulated, and there is no controlling of money supply in the system, such as with fiat currencies. Furthermore, as security is provided by encryption, there are no financial intermediaries so payments are made directly between system participants. There is also no authority responsible for monetary intervention. Bitcoin is the most important cryptocurrency, but there are numerous other cryptocurrencies, such as Litecoin, Ripple, DigitalCash, Ethereum, and others . Many of these cryptocurrencies have been created for special purposes; for example, Dogecoin is almost exclusively used by members of Reddit, a popular social media site . Other motives for creating new cryptocurrencies are (i) to improve some of Bitcoin’s weaknesses and to establish alternative algorithms and ways to validate the transactions, (ii) to gather experience with alternative supply schemes (i.e. fixed or variable), (iii) to supply mining alternatives to the complex Bitcoin mining process, (iv) to enhance attention to cryptocurrencies in general, in order to profit from this, and more . Some researchers expect that alternative cryptocurrencies might catch up to Bitcoin . On the other hand, up to now development seems to have followed “winner takes all” dynamics , however, it is too early for a conclusion as yet. The high volatility of Bitcoin is well-documented [19,20]. For example, using GARCH models, Gronwald  found extreme price jumps for Bitcoin, but more recently volatility has been decreasing since 2015 . This development is to be expected in an emerging market. In a similar way, using a descriptive evaluation, Briere  found exceptionally high returns and high volatility of Bitcoin, and high skewness . They argue that Bitcoin may be used as a hedge in crises, which may add to its attractiveness for investors [24,25] but see refs. [26,27]. Briere  found a positive correlation with gold which supports this view, which seems to hold especially for the period before the Bitcoin crash in December 2013, where Bitcoin exhibited risk reduction capabilities when added to equity portfolios . Bartos  compared the mean return and the standard deviation of Bitcoin valuation to stocks of Google and Facebook, to the Dow Jones Index, the S&P 500, and gold. It was found that both indices were many times higher for Bitcoin . In addition, Bitcoin does not essentially correlate with the other assets mentioned . These results corroborate the hypothesis that Bitcoin is primarily used as a speculative investment which may depend much on sentiment . In line with this, McDonnell  found that the Bitcoin values correlate negatively with stock values, indicating speculative behaviour, i.e. investing in Bitcoin in order to receive higher returns . Dwyer  also found high Bitcoin volatility as compared to the volatility of gold and the USD. Kubat  found that volatility of the Polish Zloty is considerably higher than that of the Euro but still much lower than Bitcoin volatility. Overall, there are far fewer comparisons of Bitcoin volatility with that of currencies other than those of large world economies, especially USD and EUR. Such comparisons are relevant, however. Firstly, the financial service sector is developing and innovating rapidly . Secondly, it might be possible that economies with high-volatility currencies might be inclined to perform (at least some of their) transactions in Bitcoin if volatility is comparable or even lower, as high volatility might be detrimental to export activity in developing countries . Furthermore, Bitcoin as a cryptocurrency has the potential comparative advantage of less costly transfer as a trading currency . Bitcoin might also have hedging capabilities, as already pointed out. There is evidence that currencies of emerging markets are more volatile because of their greater elasticity to external shocks  and greater sensitivity to global volatility . Based on the definition of emerging markets given by the World Bank, Gavotti  analysed the volatilities of the five highest-volatility currencies (excluding the Argentine Peso): the South African Rand, Colombian Peso, Russian Ruble, Brazilian Real, and Turkish Lira. He determined the length of phases where volatility of these currencies was higher than Bitcoin volatility and found higher volatility of, for example, the Russian Ruble in 52 days, using a moving 30-day window. Overall, though, Bitcoin volatility remained significantly higher. H1: The volatility of Bitcoins is comparable to the volatilities of least developed countries’ currencies. As stated, Bitcoin is the most important cryptocurrency. If the volatility of Bitcoin decreases over time, it is to be expected that Bitcoin volatility will be lower than the volatility of other cryptocurrencies. This leads to the hypothesis that Bitcoin behaves more than a least developed country currency, in terms of volatility, than other cryptocurrencies. H2: In terms of volatility, Bitcoin behaves more like a least developed country currency than a cryptocurrency. H3: As the volatility of Bitcoin decreases over time, it gets closer to the volatility of least developed countries’ currencies. The term “least developed countries”1 has been defined by the United Nations2 applying the following criteria: Poverty3, Human Resource weakness, Economic vulnerability4. The currency data for South Sudan was also analysed but its meaningfulness in this context is limited because of the civil war, which created severe economic problems, and the exceptionally high volatility of its currency. The data used for the analyses is the daily currency prices (close prices) for the countries listed above from March 2, 2014, to March 3, 2017. This generates 1,099 closing prices for each country. Data was obtained from the Bloomberg Currency Database. Based on this data, 1,098 (n-1) return indices were computed as described before, and 1,069 (n-30) 30-day moving windows. Furthermore, Gross National Income data per capita 2015 (purchasing power parity, PPP method) was obtained from the World Bank Database . The volatilities of the countries listed above will be compared to the volatility of Bitcoin. This comparison will be made by counting the number of historic volatilities based on a moving 30-day window that are higher than the corresponding Bitcoin volatilities. A widespread model used for analysing time series data of price behaviour is the GARCH (General Autoregressive Conditional Heteroskedasticity) model family also used for analysing Bitcoin volatility [21-23]. It captures volatility clusters in a time series and additional extreme jumps, like reaction to shock. In order to capture specific patterns such as nonlinearity (which has been observed during the Bitcoin valuation rise and subsequent crash in 2013), extensions to the model are needed . According to the hypotheses, however, the goal is not to analyse Bitcoin volatility per se (as this has been done elsewhere), but to compare Bitcoin volatility to the volatilities of other currencies. Second, it would be valuable to be able to compare the results with Gavotti’s study  of historic volatility comparison between Bitcoin and emerging countries’ currencies. Therefore, the descriptive procedure of the Gavotti  study is adopted, i.e. the number of times (in days) the volatility of a given country exceeds that of Bitcoin is computed. In this context, volatility measures distribution of returns from its mean. The volatility definition used in this paper is the historical definition5 for the purpose of determining the average deviation from the average price over time . The volatility of Bitcoin and some other cryptocurrencies (see below) was calculated on a 30-day base, using the following formula. As the currency price at closing was used (time series of currency prices), the xi is calculated by using the natural logarithm6. The standard deviation was calculated for a 30-day window. Dourado’s formula  uses the standard deviation of the distributions of Bitcoin and other cryptocurrencies, because the implied volatility cannot be used as it is a measurement for expected volatility and is calculated sing the market price of traded options for that asset, but the options market for Bitcoins as well as other cryptocurrencies has not matured yet . With respect to the first hypothesis (“The volatility of Bitcoins is comparable to the volatilities of least developed countries’ currencies”), the table shows the number of times in days the volatility of the currency of the espective country in the left column exceeds Bitcoin volatility. Furthermore, in the far right column, the GNI per capita 2015  (PPP method) is shown. The correlation between the number of currency volatilities exceeding Bitcoin volatility and the GNI per capita index (far right column in the table) is 0.121 (n = 36, p = 0.244), so there is no direct relation between currency volatility and GNI. The Table 1 shows there are 14 countries (out of 39, or 35.9%) with no single currency volatility exceeding Bitcoin volatility. This is shown in Column 2, where a “0” means that all 30-day-window volatilities for the respective currency are lower than Bitcoin volatility. The mean percentage of currency volatilities exceeding Bitcoin volatility is 5.21 (the mean of the third column in the Table 1). Table 1: Comparing volatilities of the least developed countries’ currencies with Bitcoin volatilities; and GNI per capita. These results indicate that for five currencies volatility exceeds Bitcoin volatility more than 10% of the time: Liberia, Madagascar, Mauretania, Rwanda, and Sierra Leone. Gavotti (2016) found currency volatility of the Russian Ruble exceeding Bitcoin on 52 of 365 days, which is 14.2%. For these countries, the volatility was compared with Bitcoin volatility by comparing the volatility means. If the volatilities are comparable, these volatilities should not deviate too much; in other words, a test of their differences should not lead to significant results. The following table shows the results of this analysis. The mean Bitcoin volatility is 0.0278, with a variance of 0.00024 (Table 2). Table 2: Comparison of currency volatilities of selected countries with Bitcoin. The Table 2 shows that all comparisons are highly significant, further depreciating the hypothesis that Bitcoin volatility is comparable to the volatilities of least developing countries’ currencies (for South Sudan, the sign of the t value is reversed because this is the only country whose currency was more volatile than Bitcoin most of the time). With respect to the second hypothesis (“In terms of volatility, Bitcoin behaves more like a least developed country currency than a cryptocurrency”), Bitcoin was evaluated against the volatilities of some other cryptocurrencies. The data used for the analyses are the daily currency prices (closing prices, in US $) for the cryptocurrencies listed in the table below. The time period was considered such that it matched the time period of the Bitcoin prices, which was March 2, 2014, to March 3, 2017, as described earlier. Therefore, the number of time points considered is not always equal (for example, for Ethereum, the time series starts at August 7, 2015) (Table 3). Table 3: Comparing volatilities of selected cryptocurrencies with Bitcoin volatility. As the table shows, the volatilities of the other cryptocurrencies are higher in most cases than Bitcoin volatility. The volatility of Litecoin is higher than that of Bitcoin in 73.31% of cases; the volatility of Monero is higher in 99.11% of cases. As before, the means of volatility were compared using a t-test (for comparison, the mean Bitcoin volatility is 0.0278, with a variance of 0.00024; as stated before) (Table 4). Table 4: Comparison of volatilities of selected cryptocurrencies with Bitcoin. As the table shows, even the two cryptocurrencies with the smallest number of volatilities exceeding Bitcoin volatility differ highly significantly from Bitcoin volatility. Therefore the other cryptocurrencies were not tested in the same way, as their volatility is even higher than that of Litecoin and Zcash. The results show that the volatility of other cryptocurrencies is considerably higher, on average, than that of Bitcoin volatility (Table 5). Table 5: Comparing cryptocurrency and Bitcoin volatility for first half and second half. 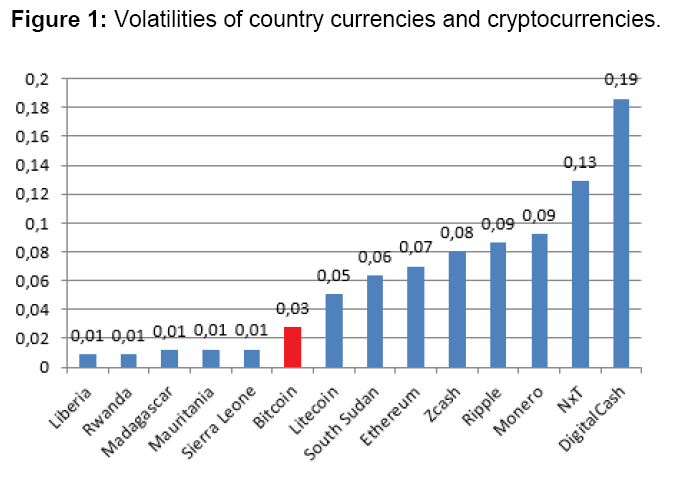 The illustration below shows the volatilities of the least developed countries’ currencies with the highest volatilities (on the left), Bitcoin volatility, and volatilities of other cryptocurrencies (on the right) (Figure 1). Figure 1: Volatilities of country currencies and cryptocurrencies. The volatility of Bitcoin is roughly three times higher than that of most country currencies (except for the currency of South Sudan), but the volatility of Digital Cash is about six times higher than that of Bitcoin, and the volatilities of most other cryptocurrencies are also much higher than that of Bitcoin. There is support for hypothesis H2 that Bitcoin behaves more like a least developed country currency than a cryptocurrency in terms of volatility. The volatility differences to the currencies of the least developed countries are smaller than the volatility differences to other cryptocurrencies. In addition, the question was analysed as to whether there is a change in volatility over time for Bitcoin and for the other cryptocurrencies analysed as well, and if the volatility reduction is stronger for Bitcoin than for the other cryptocurrencies. The following table contains the respective data. The numbers indicate instances where cryptocurrency volatility exceeds Bitcoin volatility (Table 5). It does indicate, though, that Bitcoin volatility does not reduce in the second half, in relation to the cryptocurrencies’ volatilities. 47.6% of the instances where the cryptocurrency volatilities exceed the Bitcoin volatility occur in the second half, which is what would be expected if there is no time effect (the only exception to this pattern is Zcash). On this rough, descriptive basis, there is no time-dependent change in the relation of Bitcoin volatility to the volatilities of the other cryptocurrencies. In addition, the correlations of Bitcoin volatilities (30-day moving window) to the other cryptocurrencies as well as to the least developed countries’ currencies with highest volatilities are shown in the Figure 2. 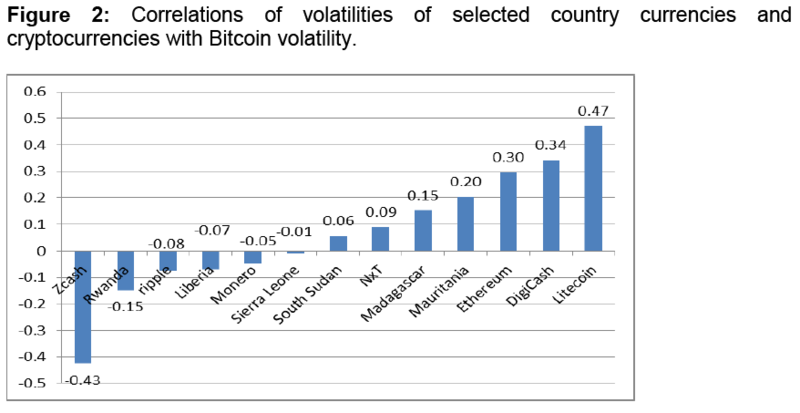 Figure 2: Correlations of volatilities of selected country currencies and cryptocurrencies with Bitcoin volatility. The correlations range from -0.43 to 0.47, and there is no clear pattern. On average, correlations of Bitcoin volatility with the volatilities of the selected countries’ currencies are not higher than the correlations of Bitcoin with the other cryptocurrencies. There is, then, no further support for H2 (“In terms of volatility, Bitcoin behaves more like a least developed country currency than a cryptocurrency”). In terms of change and correlation, Bitcoin does not seem to differ markedly from the behaviour of the other cryptocurrencies. With respect to the third hypothesis (“As the volatility of Bitcoin decreases over time, it gets closer to the volatility of least developed countries’ currencies”), first a test of this reduction was conducted. An OLS regression with time as predictor was performed based on the Bitcoin 30-day-window volatility data used here. The following table shows the result (Table 6). Table 6: OLS regression of Bitcoin volatility on time. This result is consistent with Gavotti  and Dourado . Bitcoin volatility has been decreasing over time. The result is significant, and the t-statistic for the independent variable “time” is negative. This means that the more time elapses, the less volatile the Bitcoin returns are. On the other hand, R square is low (7.4%), meaning that Bitcoin volatility is due to many other aspects not accounted for in the regression. In the next step, data from selected currencies was grouped into six equal time phases. These currencies were: LRD, MGA, MRO, SWF, SLL (the five most volatile African currencies), KHR, YER (the two most volatile Asian currencies), SBD, VUV (the most volatile Pacific Island currencies), and HTG (Latin America, Haiti). These are the most volatile currencies of least developed countries (with the exception of South Sudan, as noted). For each currency and time period, the share of days (in per cent) where volatility exceeded Bitcoin volatility is shown in Table 7. (For example, LRD volatility exceeded Bitcoin volatility on 34.83% of the days in the period 3/31/14 to 9/24/14). Table 7: Percentage of days where currency volatility exceeds Bitcoin volatility. With respect to the third hypothesis, it can be seen that for the first period, with one exception (LRD), none of the currencies’ volatilities exceed Bitcoin volatility. For the African currencies, this situation changes after March 2015. For the other currencies shown here, this situation starts to change at the end of 2015. Figure 3 shows the mean percentages per time period for the currencies contained in Table 7 (mean of all currencies in the table per time period). There is a peak in volatility of the currencies in the time period from September 2015 to March 2016. The relative decrease in volatility of Bitcoin does not seem to continue later on in 2016. Taken together, the hypothesis that Bitcoin volatility gets closer to the volatilities of the most volatile currencies of least developed countries might be accepted but, as the data for late 2016 and for 2017 suggests, this situation might change again. 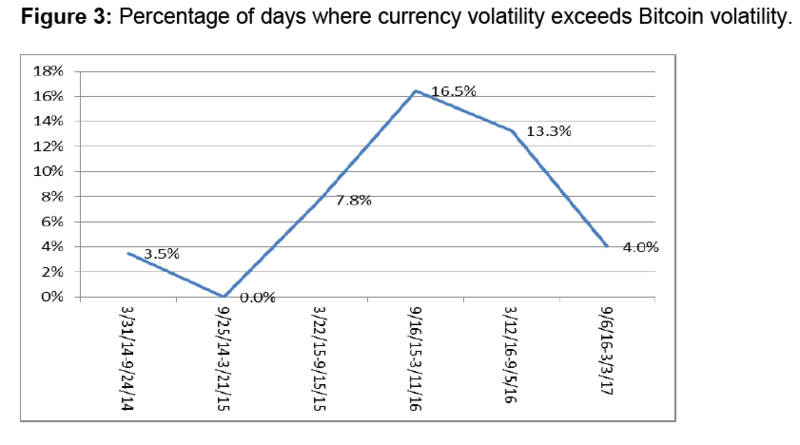 Figure 3: Percentage of days where currency volatility exceeds Bitcoin volatility. In this paper, we have sought to extend the discussion of Bitcoin volatility to a comparison with the volatilities of currencies of least developed countries. In addition, this work extends analysis to data for early 2017. It was found that Bitcoin volatility is still much higher. Overall, for 94.8% of the data this was the case. Nevertheless, there are five African countries whose currencies exhibit considerable volatility. Even in these cases, Bitcoin volatility is higher most of the time. This situation seems to have changed in 2015/2016, but this change was not sustained. For the most recent data, Bitcoin volatility again seems to be higher, relative to the volatilities of the currencies analysed. In terms of volatility, Bitcoin does not seem to qualify as an alternative to the currencies analysed. This is a key result of this study. Possibly, this might be the case in specific sectors of goods and services, or as a trading currency, as pointed out by Dwyer . These results resemble those of Dyhrberg , who found that Bitcoin reacts somewhat similarly to, but not exactly like, the Dollar, and like a currency in general. Dyhrberg  conjectures that, being decentralised and unregulated, Bitcoin (and other cryptocurencies as well) cannot react exactly like a currency. In extending Dyhrberg’s results [24,26], Bitcoin might show hedging capabilities for the least developed countries’ currencies. This remains to be analysed [37,38]. In addition, comparing Bitcoin volatility with the volatilities of other major cryptocurrencies showed that volatilities of these other cryptocurrencies are, in fact, much higher than Bitcoin volatility. This is true for all other cryptocurrencies considered, and the volatilities of all cryptocurrencies considered are higher than those of all least developed countries’ currencies considered, except South Sudan Pound. In terms of volatility, therefore, Bitcoin seems more similar to the currencies of least developed countries than to other cryptocurrencies. This might point towards a process of decreasing volatility over time for cryptocurrencies in general. On the other hand, Bitcoin volatility does not seem to change more than volatility of other cryptocurrencies. These patterns have to be explored further. The practical implication of these results is that other cryptocurrencies qualify even less as alternatives for the least developed countries’ currencies analysed, when compared to Bitcoin. In extending the analysis to 2017, one interesting result appears to be that the recent decrease in Bitcoin volatility often reported in the literature does not seem to continue in relation to the currencies analysed here. 1Africa (27): Angola (AOA), Benin/ Burkina Faso (XOF), Burundi (BIF), Central African Republic (XAF), Comoros (KMF), Democratic Republic of Congo (CDF), Djibouti (DJF), Eritrea (ERN), Ethiopia (ETB), Gambia (GMD), Guinea (GNF), Guinea-Bissau (GBS), Lesotho (LSL), Liberia (LRD), Madagascar (MGA), Malawi (MWK), Mauritania (MRO), Mozambique (MZN), Rwanda (RWF), Sao Tome and Principe (STD), Sierra Leone (SLL), Somalia (SOS), South Sudan (SSP), Sudan (SDG), Tanzania (TZS), Uganda (UGX), Zambia (ZMK); Asia (9): Afghanistan (AFN), Bangladesh (BDT), Bhutan (BTN), Cambodia (KHR), East Timor (TPE), Laos (LAK), Myanmar (MMK), Nepal (NPR), Yemen (YER) Pacific Islands (3): Solomon Islands (SBD), Tuvalu (TVD), Vanuatu (VUV); Latin America (1): Haiti (HTG). Tuvalu is missing and not analysed in the list because no data was obtained from the Bloomberg database. 2The United Nations (UN) is an intergovernmental organization to promote international co-operation. The organization was established on 24 October 1945 after World War II in order to prevent another such conflict. The UN has 193 members. 3Adjustable criterion based on GNI per capita averaged over three years. As of 2015 a country must have GNI per capita less than US $1,035 to be included on the list, and over $1,242 to graduate from it. 4Economic vulnerability based on instability of agricultural production, instability of exports of goods and services, economic importance of non-traditional activities, merchandise export concentration, a handicap of economic smallness, and the percentage of population displaced by natural disasters. 5Historical volatility (HV) is the realized volatility of a financial instrument over a given time period. Generally, this measure is calculated by determining the average deviation from the average price of a financial instrument in the given time period. Standard deviation is the most common but not the only way to calculate historical volatility. Alternative volatilities are: Implied Volatility (in financial mathematics, the implied volatility of an option contract is that value of the volatility of the underlying instrument which, when input into an option pricing model – such as Black–Scholes - will return a theoretical value equal to the current market price of the option. ); the beta of an investment indicates whether the investment is more or less volatile than the market. 6The natural logarithm of a number is its logarithm to the base of the mathematical constant e, where e is an irrational and transcendental number approximately equal to 2.718281828459. Raymaekers W (2015) Cryptocurrency Bitcoin: Disruption, challenges and opportunities. Journal of Payments Strategy and Systems 9: 30-40. Bartos J (2015) Does Bitcoin Follow the Hypothesis of Efficient Market? International Journal of Economic Sciences 4: 10-23. Baur D, Hong K, Lee A (2015) Bitcoin: Currency or Asset? Hamburg, Kühne Logistics University. Dong H, Dong W (2014) Bitcoin: Exchange Rate Parity, Risk Premium, and Arbitrage Stickiness. British Journal of Economics, Management and Trade 5: 105-113. Briere M, Oosterlinck K, Szafarz A (2013) Virtual Currency, Tangible Return: Portfolio Diversification with Bitcoins. Journal of Assessment Management 16: 365-373. McDonnell A (2014) Popping the Bitcoin Bubble: An application of log-period power law modeling to digital currency. University of Notre Dame. Iwamura M, Kitamura Y, Matsumoto T (2014a) Is Bitcoin the Only Cryptocurrency in the Town? Economics of Cryptocurrency and Friedrich A. Hayek. Discussion Paper Series A No. 602, Institute of Economic Research, Hitotsubashi University, Japan. Iwamura M, Kitamura Y, Matsumoto T, Saito K (2014b) Can we stabilize the price of a Cryptocurrency? : Understanding the design of Bitcoin and its potential to compete with Central Bank money. Discussion Paper Series A No.617, Institute of Economic Research, Hitotsubashi University, Japan. Rey H (2013) Dilemma not Trilemma: The Global Financial Cycle and Monetary Policy Independence. London Business School, CEPR and NBER. Bordo MD, Schwartz AJ (1987) The Importance of Stable Money: Theory and Evidence. University of Chicago Press. Serenis D, Tsounis N (2014) Does Exchange Rate Variation Effect African Trade Flows?. Procedia Economics and Finance 14: 565-574. Yermack D (2015) Is Bitcoin a Real Currency? In: David KCL (Ed. ), The Handbook of Digital Currency. Elsevier, pp: 31-44. Wang J, Xue Y, Liu M (2016) An Analysis of Bitcoin Price Based on VEC Model. International Conference on Economics and Management Innovations (ICEMI 2016), pp: 146-152. Gandal N, Halaburda H (2014) Competition in the Cryptocurrency Market. Bank of Canada Working Paper. Blundell-Wignall (2014) The Bitcoin Question: Currency versus Trust-less Transfer Technology. OECD Working Papers on Finance, Insurance and Private Pensions, No. 37, OECD Publishing. Lo S, Wang JC (2014) Bitcoin as Money? Federal Reserve Bank of Boston, Working Paper, No. 14. Gronwald M (2014) The Economics of Bitcoins - Market Characteristics and Price Jumps. CESifo Working Paper, No. 5121. Bouoiyour J, Selmi R (2015) Bitcoin Price: Is it really that New Round of Volatility can be on way? Economics Bulletin. Katsiampa P (2017) Volatility estimation for Bitcoin: A comparison of GARCH models. Economics Letters 158: 3-6. AH (2016a) Hedging capabilities of Bitcoin. Is it the virtual gold? Finance Research Letters 16: 139-144. Dyhrberg AH (2016b) Bitcoin, gold and the dollar: A GARCH volatility analysis, Finance Res Lett 16: 85-92. Bouri E, Molnar P, Azzi G, Roubaud D, Hagfors L (2017a) On the hedge and safe haven properties of Bitcoin: Is it really more than a diversifier? Finance Research Letters 20: 192-198. Bouri E (2017b) Does Bitcoin hedge global uncertainty? Evidence from wavelet-based quantile-in-Quantile regressions. Finance Research Letters. Bukovina J, Martiček M (2016) Sentiment and Bitcoin volatility. MENDELU Working Papers in Business and Economics 58/2016. Mendel University in Brno. Glaser F, Zimmermann K, Haferkorn M, Weber MC, Siering M (2014) Bitcoin - Asset or Currency? Revealing Users' Hidden Intentions. ECIS 2014, Twenty Second European Conference on Information Systems, Tel Aviv 2014. Dwyer GP (2014) The Economics of Bitcoin and Similar Private Digital Currencies. Clemson University and the University of Carlos III, Madrid. Kubat M (2014) Virtual currency Bitcoin in the scope of money definition and store of value. Procedia Economics and Finance 30: 409-416. Gavotti E (2016) Bitcoin as a currency: A volatility comparison against emerging market currencies. London Metropolitan University. Cairns J, Ho C, McCauley R (2007) Exchange rates and global volatility: implications for Asia-Pacific currencies. BIS Quarterly Review, pp: 41-52. Ali R, Barrdear J, Clews R, Southgate J (2014) Innovations in payment technologies and the emergence of digital currencies. Bank of England Quarterly Bulletin.